As 2018 comes to a close, we have one more release for you in the form of PowerCLI 11.1.0! If you’re keeping track, that brings us to 6 official PowerCLI releases in the 2018 calendar year. To quickly summarize 2018: PowerCLI has gone multi-platform, added 2 new modules, added 25 new cmdlets, and supported new VMware product versions faster than ever! There were also quite a few other updates that involve PowerCLI, such as the Fling modules containing high-level cmdlets for NSX-T and VMware Cloud on AWS, the Code Capture addition to the HTML5 Web Client Fling, and the brand-new PowerShell DSC Resources for VMware! The VMware.VimAutomation.Storage module received a couple updates to fix some issues. The Get-VsanDisk cmdlet has been updated to now also list the vSAN disk where the Witness Component resides. An update has additionally been made to the Start-SpbmReplicationTestFailover cmdlet so that it no longer requires the VvolId parameter. PowerCLI 11.1.0 has been released and completes the 6th release of the year! This new release includes support for Site Recovery Manager 8.1, as well as converting the SRM module over for multi-platform support. Two storage cmdlets have been updated to fix some reported issues. Lastly, some dependencies for the DeployAutomation and ImageBuilder modules have been updated. For more information on changes made in VMware PowerCLI 11.1.0, including improvements, security enhancements, and deprecated features, see the VMware PowerCLI Change Log. 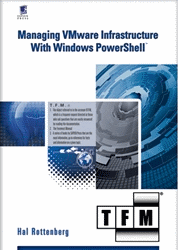 For more information on specific product features, see the VMware PowerCLI 11.1.0 User’s Guide. For more information on specific cmdlets, see the VMware PowerCLI 11.1.0 Cmdlet Reference. This entry was posted in General and tagged PowerCLI, release on December 20, 2018 by Kyle Ruddy. No obvious link to actually download PowerCLI 11.1?